VIRGINIA WOOLF: An Inner Life. Julia Briggs, 528 pgs. Harcourt. "Virginia Woolf is one of the most influential figures in twentieth-century literature. She was original, passionate, vivid, dedicated to her art. Yet most writing about her still revolves around her social life and the Bloomsbury set. In this fresh, absorbing book, Julia Briggs puts the writing back at the center of Woolf's life, reads that life through her work, and mines the novels themselves to create a compelling new form of biography. 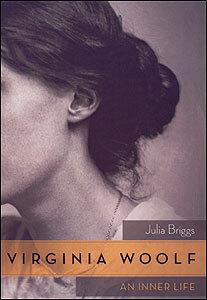 Analyzing Woolf's own commentary on the creative process through her letters, diaries, and essays, Julia Briggs has produced a book that is a convincing, moving portrait of an artist, as well as profound meditation on the nature of creativity".